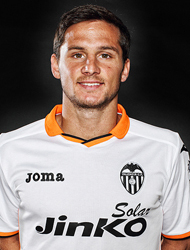 Valencia CF: Salvo trying to get rid of Pablo Piatti? Salvo trying to get rid of Pablo Piatti? Valencia CF president is supposedly flying to Germany today and one of his primary objectives would be to convince Pablo Piatti to accept Ukrainian team Metalist offer. Pablo Piatti doesn't want to go to Ukraine and would like to be able to continue in Spain or in England, both options are out of the question right now as most Spanish teams are broke and English ones don't generally want small players in their ranks. The Ukrainian team are said to be offering about 5 million euros for Pablo Piatti, quite lower than the 7.5 million Valencia CF paid for him to bring him from Almeria. Since his arrival he hasn't justified his price tag, but on the other hand the club did overpay for him. I've always liked his play, its not amazing, but its fast and offensive and I think he's suffered due to the slow play of the midfield. I also think he could be best utilized as a second striker way more effectively where can can score goals, rather than on the wings. I don't know, I think 5 million is a bit too little to sell him for, especially since we don't really have replacements. I mean who will replace Feghouli when he is injured and we all know Piatti plays best on the right side.